Each type of industry has its particular features. Whether in petro chemicals, general mechanical engineering or ship building – the specifications vary in physical properties, preferred materials all the way to cable standards. Also in liquid level measurement and in our case the magnetic level indication (Visual Level Indicator – VLI), the demands have to be met. By adding electrical accessories such as magnetic switches or/and level transmitters a VLI can be upgraded to become a reliable system. These can be used as actuator for pump and valve actions as well as analysing points within an SPS or computer system. Apart from the choice of materials and adherence to standards, the electrical connection is furthermore an important factor. Integrated cables of 3m, 5m, 10m and 20m length are usually long enough to connect easily to a junction box or a circuit branch. However it is difficult to find a cable suitable for all requested requirements. Halogen free or chemical resistance are just a few of the demands. Furthermore important are the temperature range and type of shielding. 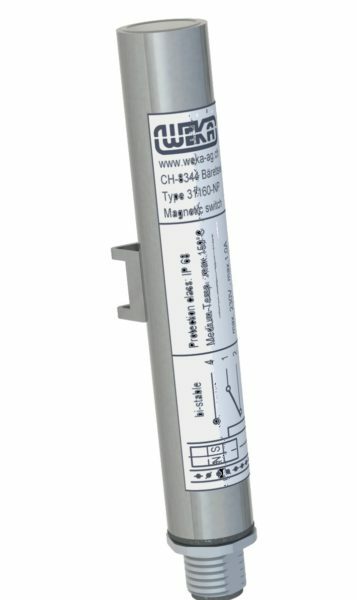 In order to create a universal interface allowing the customer to use his own cables, WEKA has launched a new magnetic switch series using M12 plug-connectors. The M12 thread is according to IEC 61076-2-101 standard and is readily available worldwide. The main advantages are: A mating plug either straight or angled can be purchased as well and be mounted on to the customer’s cable. Or else a cable with already injectionmoulded mating plugs can be used. The magnetic switch with M12 plug-connectors is moreover lower in price than their cable-using counterparts. They are easy to install and to be swapped in case of replacement. Finally they offer all the well known advantages such as change-over technology, high loading capacity and an extremely robust stainless steel casing. Each VLI can be upgraded with any kind of magnetic switch even if the level indicator has been in use for decades.